Special Cake Tribute to the Worcester Festival… Featuring Percy! Oak Furniture Land is opening a brand new store in Worcester this Saturday – yes, the first day of the Festival! – and in celebration they’ve decided to bake a cake… a great big cake… in fact, a quite amazing and enormous cake! 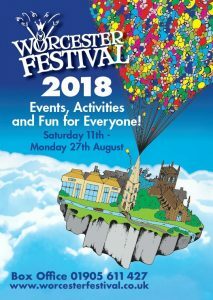 And what’s even better, they’re dedicating it to the Worcester Festival as a big ‘Hoorah!’ for both of our big First Days! In honour of the Hearts, Humours and Hogs event at the George Marshall Medical Museum that day, the super-sized 3D cake sculpture, designed and baked by professional cake artists, will be an anatomically correct, to-scale replica of the teaching dummy of the human body, complete with removable cake internal organs(! ), with a cheeky Percy the Peacock having a look – always got his beak in something, that Percy! Yes – genuinely – all made of cake! A mixture of chocolate and vanilla sponge cake to be precise – sounds delicious!! Percy will be at the store for it’s grand opening on Saturday morning, where he and the Mayor of Worcester will receive the cake on behalf of the Festival, before it is whisked over to the George Marshall Medical Museum, for anyone attending their event to marvel at! And then Percy and the Mayor will be flying straight over to the Guildhall ready for the official opening of the Festival at 10.50am. It’s non-stop! So – here’s to a fantastic first weekend of the festival, and here’s to… well, having your cake and eating it! And good luck to Oak Furniture Land with their new store – we can’t wait to see the cake! Watch this space – pics coming soon! !